A lectin function within CD11b mediates both cytotoxic priming of Mac-1/complement receptor type 3 (CR3) by β-glucan and the formation of transmembrane signaling complexes with GPI-anchored glycoproteins such as CD16b (FcγRIIIb). A requirement for GPI-anchored urokinase plasminogen activator receptor (uPAR; CD87) in neutrophil adhesion and diapedesis has been demonstrated with uPAR-knockout mice. In this study, neutrophil activation conditions generating high-affinity (H-AFN) or low-affinity (L-AFN) β2 integrin adhesion were explored. A role for the Mac-1/CR3 lectin domain and uPAR in mediating H-AFN or L-AFN adhesion was suggested by the inhibition of Mac-1/CR3-dependent adhesion to ICAM-1 or fibrinogen by β-glucan or anti-uPAR. The formation of uPAR complexes with Mac-1/CR3 activated for L-AFN adhesion was demonstrated by fluorescence resonance energy transfer. Conversely, Jurkat cell LFA-1 H-AFN-adhesion to ICAM-1 was not associated with uPAR/LFA-1 complexes, any requirement for GPI-anchored glycoproteins, or inhibition by β-glucan. A single CD11b lectin site for β-glucan and uPAR was suggested because the binding of either β-glucan or uPAR to Mac-1/CR3 selectively masked two CD11b epitopes adjacent to the transmembrane domain. Moreover, treatment with phosphatidylinositol-specific phospholipase C that removed GPI-anchored proteins increased CD11b-specific binding of 125I-labeled β-glucan by 3-fold and this was reversed with soluble recombinant uPAR. Conversely, neutrophil activation for generation of Mac-1/CR3/uPAR complexes inhibited CD11b-dependent binding of 125I-labeled β-glucan by 75%. These data indicate that the same lectin domain within CD11b regulates both the cytotoxic and adhesion functions of Mac-1/CR3. The leukocyte αMβ2 integrin known also as Mac-1, complement receptor type 3 (CR3),4 and CD11b/CD18 functions both as an adhesion molecule facilitating diapedesis and as a C3R enabling phagocytosis or degranulation in response to factor I-cleaved C3b fragment of C3 (iC3b)-opsonized microorganisms (1, 2, 3, 4, 5). Important protein ligands such as ICAM-1, iC3b, and fibrinogen bind to overlapping sites contained within an “inserted” I-domain at the N terminus of the CD11b subunit that is induced to express a high-affinity (H-AFN) metal ion-dependent adhesion site (MIDAS) following cell activation. Notably, adhesion may also occur through the cytoskeleton-regulated clustering of integrins that retain a low-affinity (L-AFN) binding site state (6). Phagocytosis of iC3b-opsonized fungi that are captured first by the I-domain requires secondary ligation of fungal cell wall β-glucan to a distinct lectin domain contained within the C-terminal region of CD11b (7, 8, 9). Ligation of fungal β(1, 3)-glucans to the lectin domain of CD11b results in priming of the receptor, such that yeast cells bound to the I-domain via iC3b trigger “outside-in” signaling for phagocytosis or degranulation (10, 11). In addition, the binding of soluble β-glucan or yeast cell walls to the lectin domain can generate the H-AFN MIDAS conformation within the I-domain (11, 12). Several lines of evidence indicate that adhesion via Mac-1/CR3 binding to endothelial cell ICAM-1 requires the formation of membrane complexes between Mac-1/CR3 and GPI-anchored urokinase plasminogen activator receptor (uPAR). mAbs to different epitopes of uPAR can either inhibit or induce Mac-1-dependent adhesion, and removal of GPI-anchored proteins with phosphatidylinositol-specific phospholipase C (PiPLC) (13) or inhibition of uPAR synthesis with an antisense oligonucleotide (14, 15) prevents Mac-1-dependent adhesion until the cells are reconstituted with soluble recombinant uPAR (sr-uPAR) (13). Moreover, neutrophils from uPAR-deficient mice exhibit defective diapedesis into certain inflammatory sites (13, 16). A lectin-like interaction appears to be involved in uPAR-dependent adhesion because the surface complexes between uPAR and Mac-1 are disrupted by sugars such as N-acetyl-d-glucosamine (NADG) (17). These data suggest that uPAR may bind to the same lectin domain within the C terminus of CD11b that is used for cytotoxic degranulation in response to iC3b-opsonized yeast. Moreover, because similar sugar-inhibitable complexes have been observed between uPAR and CR4 (CD11c/CD18) (18), as well as between uPAR and β1 or β3 integrins (19), it appears possible that lectin-dependent complexes formed with uPAR may be important for adhesion with a broad range of integrins. Although sugar-inhibitable complexes between LFA-1 (CD11a/CD18) and FcγRIIIB have been demonstrated using resonance energy transfer (RET) techniques (20), the formation of LFA-1 complexes with uPAR has not been investigated. Nevertheless, other investigators have demonstrated the recovery of uPAR within anti-CD11a immunoprecipitates from monocytes, as well as sparse LFA-1/uPAR cocapping (21). A lectin site has been identified in both human and murine CR3 that binds soluble or particulate β-glucan. However, studies of other β2 integrins have failed to demonstrate a similar lectin activity (8, 10, 22). The exact location of the lectin site within the C terminus of CD11b has not been determined, but its blockade by β-glucan oligosaccharides containing as few as seven glucose subunits (23) suggests that it represents a relatively small portion of the C-terminal domain. Complicating mapping of the lectin site is the molecular flexibility of integrins that allows a ligand bound to one end of the molecule to generate a conformational change at the opposite end of the molecule. Thus, the binding of mAbs to the N-terminal I-domain results in a masking of the C-terminal lectin site, and conversely, small (10 kDa) β-glucans that bind to the C-terminal region can generate the H-AFN MIDAS within the I-domain. An important finding was that small β-glucans bound with sufficiently H-AFN (50 nM) to block the uptake of C-terminal domain-specific mAbs without blocking the uptake of mAbs to N-terminal epitopes (8). Moreover, recombinant C-terminal fragments of CD11b expressed on insect cells bound β-glucan with an affinity similar to native CD11b/CD18 on neutrophils (9). The current investigation sought to determine whether uPAR and small β-glucans competed for binding to the same lectin site within CD11b, and whether uPAR binding to this lectin site played a role in regulating the adhesion function of CR3. Although the primary focus was on neutrophil Mac-1/CR3 and its interaction with uPAR mediating adhesion to ICAM-1, the expression of LFA-1 on neutrophils complicated the interpretation of data and necessitated the inclusion of experiments with T cells that express only LFA-1 and not CR3. All mAbs were used as IgG purified from ascite fluid or culture medium by anion exchange chromatography (22, 24). The hybridomas secreting anti-CD11b mAbs MN-41 and OKM1 were obtained from Drs. A. Eddy and A. Michael, University of Minnesota (Minneapolis, MN) and American Type Culture Collection (Manassas, VA), respectively. Other anti-CD11b mAbs, CBRM1/5, CBRM1/10, CBRM1/21, and CBRM1/23 (25, 26) were provided by Dr. T. Springer (Center for Blood Research and Harvard Medical School, Boston, MA), and mAb24 (27) was a gift from Dr. N. Hogg (Imperial Cancer Research Fund, London, U.K.). The generation of anti-CD11b Mo1/44 mAb and preparation of F(ab′)2 coupled to FITC were previously described (20, 28). The epitopes and function blocking effects of these mAbs have recently been reviewed (5). Anti-uPAR mAb 3B10 and the generation of its F(ab′)2 coupled to tetramethylrhodamine isothiocyanate (TRITC) were previously described (17, 29, 30). Anti-CD11a mAb TS1/22 was provided by Dr. Springer and G43-25B was purchased from BD PharMingen (San Diego, CA). The hybridoma-secreting anti-human MHC class I mAb, DX17 (31), was a gift from Dr. L. L. Lanier (University of California, San Francisco, CA) and the hybridoma-secreting 3G8 anti-CD16 (FcγRIII) was obtained from Dr. J. Unkeless (Mt. Sinai School of Medicine, New York, NY). Anti-CD3-PE, anti-CD55-FITC, and anti-CD59-FITC were purchased from BD PharMingen. For flow cytometry, mAbs were coupled to FITC or the fluorescein derivative Oregon Green 488 dye according to the manufacturer’s instructions (Molecular Probes, Eugene, OR). Soluble rICAM-1-Fc (32) was generously provided by Dr. D. Staunton (ICOS, Seattle, WA). A portion of this rICAM-1 was labeled with either Oregon Green 488 or FITC. sr-uPAR was generated as described (33). PiPLC was a gift from Dr. M. Lowe, (Columbia University, New York, NY). Various preparations of a soluble zymosan-derived polysaccharide fraction made up primarily of (1, 3) β-d-glucan (β-glucan; varying in size from ∼2–20 kDa) were isolated and characterized for approximate size by Superdex 75 molecular sieve column chromatography vs dextran-FITC molecular mass standards (8, 22). For use in radioactive binding assays, an ∼10 kDa β-glucan was first coupled to tyramine by reductive amination, and then radiolabeled with Na125I using Iodogen (9). All other chemicals and reagents, except where specified, were purchased from Sigma-Aldrich (St. Louis, MO). Peripheral blood neutrophils were isolated under LPS-free conditions using two-step Ficoll/Hypaque density gradient centrifugation (34). Peripheral blood T lymphocytes were isolated using RosetteSep T Cell Enrichment Cocktail according to the manufacturer’s protocol (StemCell Technologies, Vancouver, British Columbia, Canada). Isolated T cell preparations were ≥96% CD3+, but only weak staining for uPAR was detectable by indirect immunofluorescence. The T cell line Jurkat E6-1 was obtained from the American Type Culture Collection and maintained in RPMI 1640 medium supplemented with 10% FBS. The majority of Jurkat cells bore readily detectable LFA-1 and uPAR but not Mac-1/CR3. Neutrophils were suspended in 100 μl HBSS/5 mM Ca2+/1 μM calcium ionophore A23187, seeded on cover glasses, and incubated at 37°C for 15 min. After washing with ice-cold HBSS, the neutrophils were reacted sequentially with Mo1/44 F(ab′)2 anti-CD11b-FITC and 3B10 F(ab′)2 anti-uPAR-TRITC in 1% BSA/PBS at 4°C for 20 min. Next, the stained neutrophils were washed with ice-cold PBS/1 mM EGTA and rinsed with ice-cold PBS/EGTA containing 10 mM Mg2+ and then sealed on the cover glasses in the latter solution. As a control, cells were washed with and sealed in PBS/EGTA medium without Mg2+. Duplicate slides prepared in this way were analyzed at timed intervals in parallel by immunofluorescence microscopy with a temperature controlled stage regulated at either 4°C or 37°C. Jurkat T cells cultured for 2 days in 10% FCS/RPMI 1640 medium without phenol red were stained and analyzed in a similar way as neutrophils using sequential treatments with TS1/22 anti-LFA-1 IgG plus rabbit F(ab′)2 antimouse IgG-Fc-specific Ab-FITC followed by 3B10 F(ab′)2 anti-uPAR-TRITC. Calcium ionophore that was used to up-regulate neutrophil surface CR3 to levels comparable to uPAR was unnecessary with Jurkat cells that maximally expressed LFA-1 and uPAR without stimulation. The instrumentation and methods used to measure FITC fluorescence and the TRITC fluorescence resulting from RET of excited FITC to TRITC molecules clustered to within ≤7 nm of each other have been previously described (35, 36). Neutrophils were incubated with or without PiPLC (0.25 U, 1 × 107 cells/ml) in RPMI 1640 medium/0.2% BSA at 37°C for 1 h. Typically, this treatment caused a 70–80% reduction in staining for GPI-anchored CD16b and uPAR using 3G8 and 3B10 mAbs, respectively. After washing, cells were incubated first with or without PMA (20 ng/ml) at 37°C for 20 min, and then with various FITC or Oregon Green 488-labeled mAbs at 4°C (37°C for mAb 24; Ref. 37) for 30 min. After washing, cells were analyzed by flow cytometry using a Coulter Profile II (Beckman Coulter, Miami Lakes, FL). For all flow cytometry assays, 10 μg/ml propidium iodide was added to the stained cells just before analysis to allow exclusion of dead cells that stain nonspecifically with any labeled mAb. These data consistently demonstrated ≥96% viability of neutrophils following treatment with PMA and/or PiPLC. Neutrophils were tested for uptake of 125I-β-glucan as previously described (8, 22) using 125I-β-glucan of ∼10 kDa. Briefly, neutrophils were incubated on ice with 2–4 μg/ml of 125I-β-glucan for 15 min. Triplicate aliquots of the cell suspension (1 × 106 cells) were layered onto mineral oil and the cells with bound radioactivity were separated from fluid phase unbound 125I-β-glucan by centrifugation at 14,000 × g for 1 min in 500 μl of conical centrifuge tubes. After freezing these tubes at −140°C, the tips of the tubes containing the cells with bound 125I-β-glucan were cut off and analyzed with a gamma scintillation counter. The proportion of cell-associated radioactivity that was bound specifically to Mac-1/CR3 was calculated as the net bound cpm measured with neutrophils that had been treated with 10 μg/ml of anti-CD11b mAb as compared with untreated neutrophils. In some experiments, neutrophils were treated with PiPLC as described above to remove a proportion of all GPI-anchored proteins and then membrane uPAR was selectively reconstituted by addition of sr-uPAR as previously described (33). Briefly, after cells had been treated with PiPLC, the cells were divided into two portions that were incubated either with or without 10 μM sr-uPAR for 20 min at 25°C followed by two washes of the cells to remove any remaining unbound sr-uPAR. These assays required neutrophil viability to exceed 95% to prevent nonspecific uptake of 125I-β-glucan, and therefore any neutrophil isolates exhibiting <95% viability were not used. For analysis of the binding of soluble rICAM-1 by flow cytometry, cells were stained by incubation in 1.0 μg/ml rICAM-1-FITC for 30 min at 37°C. After staining, the cells were washed two times and suspended in ice-cold PBS/0.2% BSA containing 10 μg/ml propidium iodide, and analyzed for staining by flow cytometry. For analysis of the specificity of rICAM-1-FITC staining, neutrophils, Jurkat cells, or T cells were incubated first with or without mAbs or soluble β-glucan at 4°C for 20 min, activated either with 20 ng/ml PMA or 10 mM Mg2+ in the presence of either 2 mM EGTA or 1 mM Ca2+ at 37°C for 10 min, and finally stained at 37°C for 30 min with 1.0 μg/ml rICAM-1-FITC. Costar EIA/RIA eight-well strips (Corning, Corning, NY) were coated with 100 μl rICAM-1 (2 μg/ml in PBS with 1 mM each of Ca2+ and Mg2+), incubated overnight at 4°C, and unbound binding sites were blocked with 2.5% BSA/PBS/Ca2+/Mg2+ at room temperature for 1 h. Where indicated, T cells or neutrophils were treated with PiPLC to remove GPI-anchored proteins as described for neutrophils above. Neutrophils or T cells were labeled with 51Cr by incubating 1 × 107 cells in 0.5 ml of calcium/magnesium-free HBSS/1% BSA medium with 250 μCi of Na51Cr for 1 h at 37°C, followed by three washes with this medium to remove unbound 51Cr. For neutrophil adhesion assay, 51Cr-labeled cells (8 × 104) were added into wells of eight-well strips coated with rICAM-1 and the strips were incubated at 37°C for 3.5–5 min in a water bath. For T lymphocyte or Jurkat cell adhesion assays, 51Cr-labeled cells (1 × 105) were added into the wells coated with rICAM-1 and the strips were incubated first at 4°C for 1 h and then incubated at 37°C for 10 min. Labeled cell suspensions exhibited ≥95% viability or were not used in this assay. Cells were activated for adhesion by mixture with PMA (10 ng/ml) or 10 mM Mg2+ in the presence or absence of mAbs to CD11a, CD11b, uPAR, or MHC class I (10 μg/ml), β-glucan (5 μg/ml), or α-mannan (25 μg/ml) just before addition to the rICAM-1-coated wells. With T lymphocytes and Jurkat cells, the 10 mM Mg2+ activation medium included 1 mM EGTA to chelate Ca2+ (38). After incubation, the wells were washed four times with PBS/Ca2+/Mg2+, separated into single wells, and the radioactivity of each well was determined with a gamma scintillation counter. Costar eight-well strips were coated with fibrinogen in the same way as with rICAM-1. To minimize neutrophil stimulation before the assay, neutrophils were washed and suspended in medium containing 10 μg/ml polymyxin B and the time for labeling with 51Cr was reduced from 1 h to 20 min. Following labeling, the neutrophils were washed three times and suspended in medium lacking polymyxin B. Viability was ≥95%. The cells were dispensed into 12 × 75-mm plastic tubes, suspended in calcium/magnesium-free HBSS/BSA, and incubated with or without 5 μg/ml of mAbs to CD11a (TS1/22), CD11b (MN-41), uPAR, or 10 μg/ml β-glucan (∼3 kDa) for 20 min on ice, and then triplicate 50-μl samples from each tube were added to the fibrinogen-coated wells containing 50 μl of HBSS/BSA with 2 mM each of Ca2+ and Mg2+ and 2 μg/ml of LPS. The cells were rapidly sedimented onto the well surfaces by 2-min centrifugation of the plates at 100 × g, and then the plates were placed at 37°C for 40 min to allow LPS-stimulated adhesion. After transferring the plates to an ice bath, unbound neutrophils were removed by four washes of each well with ice-cold HBSS/BSA, the individual wells were separated from the plate, and each well was analyzed for 51Cr with a gamma scintillation counter. Controls included wells lacking LPS or containing HBSS/EDTA to prevent all integrin-mediated adhesion. Because β2 integrins mediate adhesion through either H- or L-AFN binding sites, it was important to define cell stimulation conditions with both Mac-1/CR3 and LFA-1 that could be used to identify the requirements of uPAR and/or lectin site interactions. In this study, H-AFN adhesion was defined as the ability to bind fluid-phase rICAM-1-FITC that was inhibitable with mAbs to CD11a and/or CD11b (6, 39). L-AFN adhesion was defined as stimulated adhesion to a surface that did not involve generation of H-AFN binding sites and was inhibitable by mAbs to CD11a and/or CD11b. With neutrophils, T lymphocytes, and Jurkat T cells, staining with rICAM-1-FITC was detectable following stimulation with 10 mM Mg2+/2 mM EGTA, but not with 10 mM Mg2+/1 mM Ca2+ (Fig. 1⇓). PMA (20 ng/ml) was effective only with neutrophils, and corresponded to expression of the H-AFN binding site of Mac-1/CR3 as shown by staining with CBRM1/5-FITC, a specific marker of the Mac-1/CR3 H-AFN MIDAS. Tests for the specificity of rICAM-1-FITC staining stimulated by 10 mM Mg2+/EGTA (Fig. 2⇓) showed that this condition was selective for stimulation of H-AFN LFA-1 because staining was inhibited completely by a mAb to CD11a, whereas a mAb to CD11b I-domain had no effect on staining. It had previously been reported that stimulation with 10 mM Mg2+/EGTA also failed to generate the CD11b I-domain CBRM1/5 neoepitope (11). Such LFA-1 H-AFN binding of fluid ICAM-1 did not require uPAR or a β-glucan-reactive lectin site, as there was no significant inhibition by either anti-uPAR or soluble β-glucan. As expected, studies with PMA-stimulated neutrophils showed that inhibition of staining with ICAM-1-FITC required a combination of anti-CD11a and CD11b (that produced ≥75% inhibition) indicating that PMA stimulated both H-AFN LFA-1 and Mac-1/CR3 (not shown). Effect of Ca2+ on the generation of integrin H-AFN binding site(s) as indicated by staining with soluble rICAM-1-FITC. Stimulation of integrin H-AFN binding site(s) by 10 mM Mg2+ required chelation of calcium, whereas stimulation by PMA occurred in the presence of Ca2+. The results shown represent the mean ± SD of more than or equal to three assays. The single asterisks indicate that the difference in the staining obtained following stimulation with PMA and/or 10 mM Mg2+/EGTA was significantly greater (p < 0.01) than the staining obtained in the presence of 10 mM Mg2+/1 mM Ca2+. Mg2+/EGTA-stimulation of the H-AFN binding of soluble rICAM-1-FITC occurs only with LFA-1 and not with Mac-1/CR3, and shows no requirement for a β-glucan-reactive lectin site or uPAR. Anti-CD11a (TS1/22) and anti-CD11b (MN-41) were used to block LFA-1- and Mac-1/CR3-dependent binding of rICAM-1-FITC at a concentration of 2.5 μg/ml. Soluble β-glucan was tested over a range of concentrations and the data shown were obtained with the highest concentration examined (25 μg/ml). The results shown represent the mean ± SD of more than or equal to three assays. The asterisks indicate that the staining obtained with cells stimulated with 10 mM Mg2+/2 mM EGTA was significantly greater (p < 0.01) than that obtained in the presence of 10 mM Mg2+/1 mM Ca2+, and that the inhibition of staining obtained with anti-CD11a (that was nearly 100% in all cases) was significant (p < 0.001). The effect on staining produced by the other mAbs and β-glucan was not significant (p > 0.05). PMA is an activator of neutrophil adhesion and the Mac-1/CR3 H-AFN MIDAS conformation. 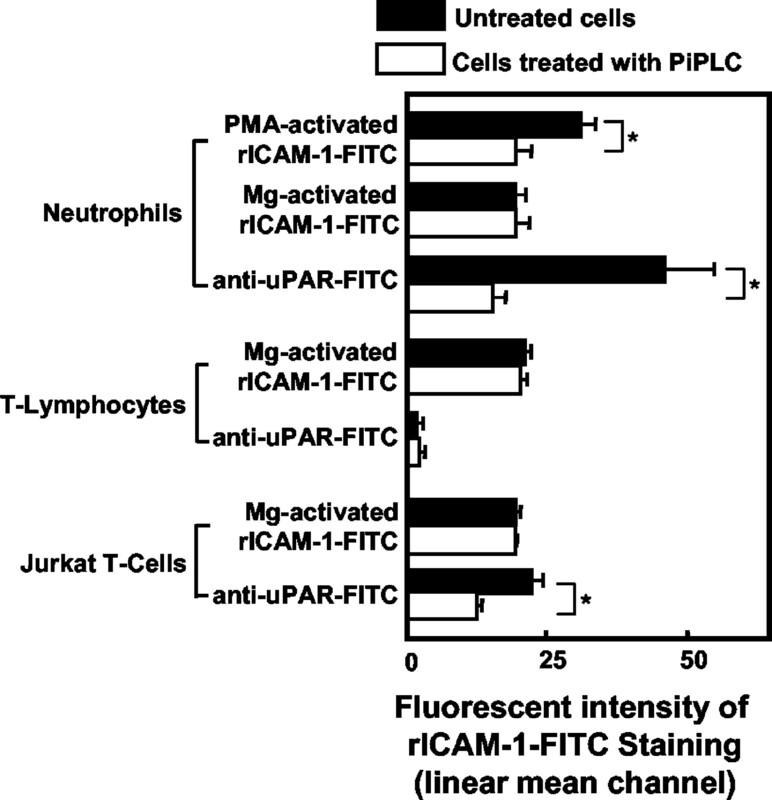 PMA-stimulated neutrophils bound soluble rICAM-1-FITC, and this was reduced 35% (p < 0.05) by prior treatment with PiPLC that removed ∼70% of cell surface GPI-anchored proteins such as uPAR (Fig. 3⇓) or CD16b (not shown). By contrast, when neutrophils were activated instead with 10 mM Mg2+/EGTA in a manner that activated only LFA-1 for H-AFN adhesion, PiPLC treatment had no effect on neutrophil binding of soluble rICAM-1-FITC (Fig. 3⇓). These data suggest that GPI-anchored proteins function only in generation of H-AFN Mac-1/CR3 and not LFA-1. Tests of PiPLC-treated uPAR− T lymphocytes (40) and uPAR+ Jurkat cells after stimulation with Mg2+/EGTA similarly failed to show any role for GPI-anchored glycoproteins in generation of H-AFN LFA-1. Although T lymphocytes did not express uPAR, tests for two other GPI-anchored T cell proteins, CD55 and CD59, showed a >90% reduction in T cell staining for these proteins following PiPLC treatment (not shown). Previous reports showed that surface complexes between uPAR and Mac-1/CR3 were dependent upon lectin-carbohydrate interactions because they were disrupted by NADG (18). If such complexes were required for Mac-1/CR3-dependent adhesion to ICAM-1, then disruption of these complexes should inhibit adhesion. Neutrophil adhesion to immobilized rICAM-1 was induced by incubation in 10 mM Mg2+ plus 1 mM Ca2+ to prevent the formation of H-AFN LFA-1. Under these conditions, adhesion to ICAM-1 was mutually dependent upon L-AFN LFA-1 and Mac-1/CR3, because mAbs to CD11a and CD11b each produced less inhibition (22 and 26%) than did a mixture of both mAbs (75%, Fig. 4⇓). As little as 5 μg/ml soluble β-glucan also produced 26% inhibition of adhesion, and β-glucan slightly augmented the inhibition activity produced by mAbs to either CD11a or CD11b. Its 25% inhibition of adhesion was similar to the 23% produced by a mAb to uPAR. However, adding β-glucan to the mixture of anti-CD11a and anti-CD11b did not produce greater inhibition than that observed with the mAb mixture without β-glucan (data not shown). Moreover, there was no significant inhibition of adhesion produced by either a mAb to class I or 25 μg/ml soluble yeast α-mannan (Fig. 4⇓). Even though these data suggest that a lectin site functions in promoting adhesion by L-AFN receptors, they do not allow distinction of which of these β2 integrins use lectin site interactions under these conditions. 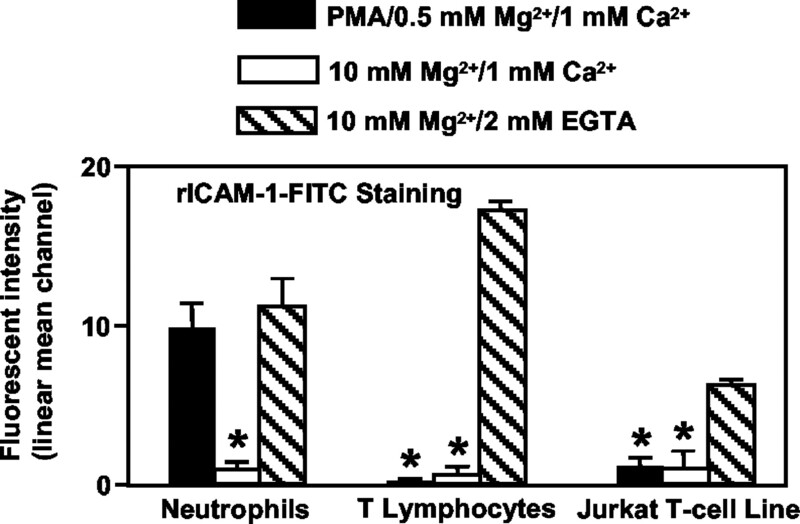 Specificity of neutrophil adhesion to immobilized rICAM-1 stimulated with 10 mM Mg2+/1 mM Ca2+. Stimulated and 51Cr-labeled neutrophils were incubated with or without mAbs, β-glucan, or α-mannan, and then the cells were added into wells coated with rICAM-1 for analysis of adhesion. mAbs to CD11b used were MN-41 or CBRM1/21. Each gave similar results and only the results obtained with MN-41 are shown. mAbs to CD11a used were TS1/22 or G43-25B. TS1/22 produced more inhibition than did G43-25B, and only the data obtained with TS1/22 are shown. The results shown represent the mean ± SD of three or more assays conducted in triplicate. Anti-CD11a, anti-CD11b, anti-uPAR, and soluble β-glucan each produced significant inhibition of adhesion relative to the control (asterisk over individual bars indicates p < 0.05). In contrast, adhesion was not inhibited significantly by either anti-class I or soluble α-mannan (n.s. over these bars indicates not significant). Mixtures of anti-CD11a or anti-CD11b plus another mAb or soluble β-glucan each produced significantly more inhibition than did the single mAb alone. The brackets over pairs of bars indicate statistical analysis of tests in which an individual mAb is compared with a mixture of that mAb with another mAb or soluble β-glucan, with a single asterisk indicating p < 0.05 and two asterisks, p < 0.01. Because the dual binding of LFA-1 and Mac-1/CR3 made it difficult to define the individual requirements for either integrin, conditions were used that were selective for each integrin. LPS is known to stimulate the H-AFN MIDAS of neutrophil CD11b, and neutrophils treated with 1 μg/ml LPS were readily stained with either soluble rICAM-FITC or CBRM1/5-FITC (not shown). Because adhesion to ICAM-1 could occur through either LFA-1 or Mac-1/CR3 (Fig. 4⇑), fibrinogen was used to coat surfaces instead of ICAM-1, because fibrinogen binds avidly to Mac-1/CR3 (41, 42) but poorly, if at all, to LFA-1 (Fig. 5⇓). Demonstration of LPS-induced neutrophil Mac-1/CR3-dependent adhesion to fibrinogen required alteration of some of the assay conditions. Stimulation of adhesion by LPS was relatively slow compared with PMA or Mg2+, requiring 40 min rather than 5 min, and its demonstration was enhanced by accelerating neutrophil sedimentation by a brief 2-min centrifugation step before incubation at 37°C. Under these conditions, adhesion of LPS-stimulated neutrophils to fibrinogen-coated surfaces was blocked 75% by anti-CD11b whereas anti-CD11a failed to produce significant inhibition. With such adhesion that was primarily H-AFN Mac-1/CR3-dependent, anti-uPAR and soluble β-glucan each produced much more inhibition of adhesion (48 and 65%) than they did with immobilized ICAM-1 (23 and 25%) where adhesion was mediated by both L-AFN Mac-1/CR3 and LFA-1 (Fig. 4⇑). However, because anti-uPAR and β-glucan each presumably functioned through a similar mechanism (i.e., disruption of uPAR/CR3 membrane complexes) a mixture of anti-uPAR and β-glucan did not produce significantly more inhibition of adhesion than did either agent individually, and in addition, there was no augmentation of the inhibition of anti-CD11b produced by addition of either β-glucan or anti-uPAR to anti-CD11b (Fig. 5⇓). Function of uPAR and the β-glucan-reactive lectin site of CR3 in neutrophil LPS-stimulated adhesion to immobilized fibrinogen. Neutrophils labeled with 51Cr under LPS-free conditions were first incubated with 1 μg/ml mAb or β-glucan (∼3 kDa; 5 μg/ml) and then added to fibrinogen-coated wells in the presence of 1 μg/ml LPS. Neutrophil adhesion was analyzed after a 40-min incubation of the wells at 37°C. The results shown represent the mean ± SD of four or more assays conducted in triplicate. Asterisks indicate a significant difference (p < 0.05) compared with the LPS-stimulated neutrophils not treated with mAb or β-glucan. Anti-CD11b, anti-uPAR, and β-glucan each produced approximately equivalent inhibition of adhesion, and there was no significant additional decrease in adhesion when anti-CD11b was combined with anti-uPAR or β-glucan, or when a mixture of anti-uPAR and β-glucan was examined. To examine a possible function of uPAR in LFA-1-dependent adhesion to ICAM-1 without assay interference from Mac-1/CR3 as had occurred with neutrophils (Fig. 4⇑), Jurkat cells and isolated peripheral blood T lymphocytes were tested instead of neutrophils because they predominantly express LFA-1 and ≤5% of peripheral blood T cells express Mac-1/CR3 (43, 44). Both types of cells were analyzed for a possible role of uPAR and lectin site interactions in Mg2+/EGTA-induced H-AFN adhesion to ICAM-1 (Fig. 6⇓). Unlike LFA-1-dependent L-AFN adhesion with neutrophils (Fig. 4⇑), T cell adhesion cannot be induced in the presence of physiologic concentrations of Ca2+, and adhesion induced by Mg2+ requires chelation of Ca2+ with EGTA (38). Such H-AFN LFA-1-dependent T cell adhesion was inhibited almost completely by a single mAb to either CD11a or ICAM-1, while there was no effect on adhesion by soluble β-glucan or mAbs to CD11b or uPAR. In addition, treatment of T cells or Jurkat cells with PiPLC that removed 60–70% of detectable uPAR from Jurkat cells and >90% of detectable GPI-anchored CD55 and CD59 from T cells, had no detectable effect on their ability to adhere to ICAM-1-coated surfaces following stimulation with 10 mM Mg2+/EGTA (data not shown). Role of LFA-1 but not uPAR or a β-glucan-reactive lectin site in T-lymphocyte or Jurkat cell adhesion to immobilized ICAM-1. T lymphocytes or Jurkat cells stimulated with 10 mM Mg2+/EGTA were incubated with or without mAb or β-glucan, and then the cells were added to wells coated with rICAM-1 and analyzed for adhesion. The results shown represent the mean ± SD of more than or equal to assays conducted in triplicate. Previous research on resting neutrophils had demonstrated the presence of lectin-dependent membrane clusters of Mac-1/CR3 with FcγRIIIB and reversible lectin-dependent complexes between Mac-1/CR3 and uPAR that were induced by cell stimulation. However, such uPAR/CR3 complexes were dissociated on the leading edge of polarized cells, making it unclear how such complexes might function in adhesion and diapedesis of leukocytes (17, 45). The current study examined neutrophils for the formation of membrane clusters between Mac-1/CR3 and uPAR using RET of an excitation signal from FITC-labeled Mac-1/CR3 to TRITC-labeled uPAR (Fig. 7⇓). With this system, excitation of TRITC by FITC requires that the excited FITC be within 7 nm of the TRITC (46). Neutrophils were stimulated by incubation in 10 mM Mg2+/EGTA that generates adhesion via H-AFN LFA-1 and L-AFN Mac-1/CR3. 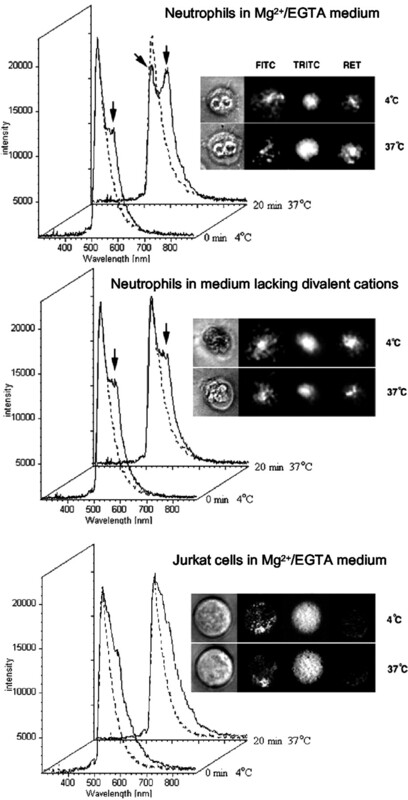 When the labeled cells in 10 mM Mg2+/EGTA were maintained at 4°C, minimal RET was observed, whereas when the cells were warmed to 37°C for 20 min a strongly positive RET signal was observed indicating the formation of greatly increased numbers of Mac-1/CR3 clusters with uPAR as compared with the sparse clusters on unstimulated cells (Fig. 7⇓, top panel). A similar 37°C incubation in the absence of 10 mM Mg2+/EGTA stimulation did not induce such an increase in uPAR clusters with Mac-1/CR3 (Fig. 7⇓, middle panel). Finally, virtually no RET was observed between Mg/EGTA-induced H-AFN LFA-1 and uPAR when uPAR+ Jurkat T cells were examined (Fig. 7⇓, bottom panel). 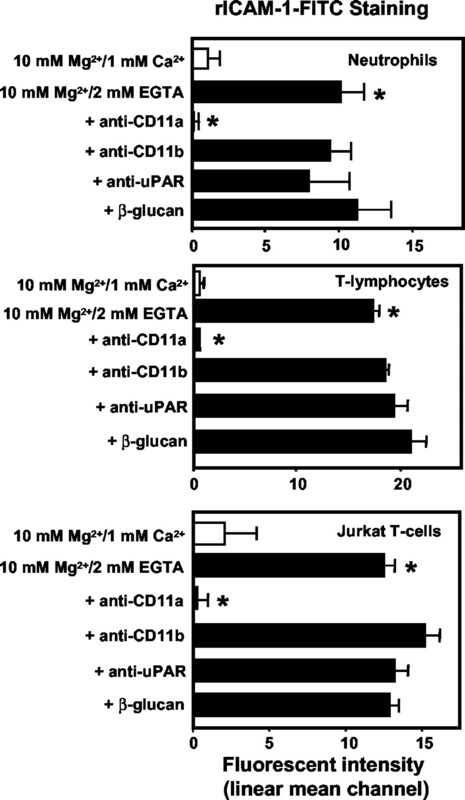 Modulating effect of 10 mM Mg2+/EGTA on the association of Mac-1/CR3 with uPAR on neutrophils but not on Jurkat cells. Cells were stained with FITC-conjugated anti-CD11b (donor) or anti-CD11a (donor) and/or TRITC-conjugated anti-uPAR (acceptor), as described in Materials and Methods. Incubation of neutrophils in 10 mM Mg2+/EGTA for 20 min at 37°C produced a significant increase in RET (indicated by arrow) between Mac-1/CR3 and uPAR as shown in the top panel (RET counts = 13,010 ± 895 at 4°C vs 16,023 ± 962 at 37°C; p < 0.001). By contrast, in the absence of Mg2+ during a similar incubation of neutrophils at 37°C, there was no change in the RET from Mac-1/CR3 to uPAR as shown in the middle panel (RET counts = 13,531 ± 886 at 4°C vs 12, 789 ± 873 at 37°C; p > 0.05). 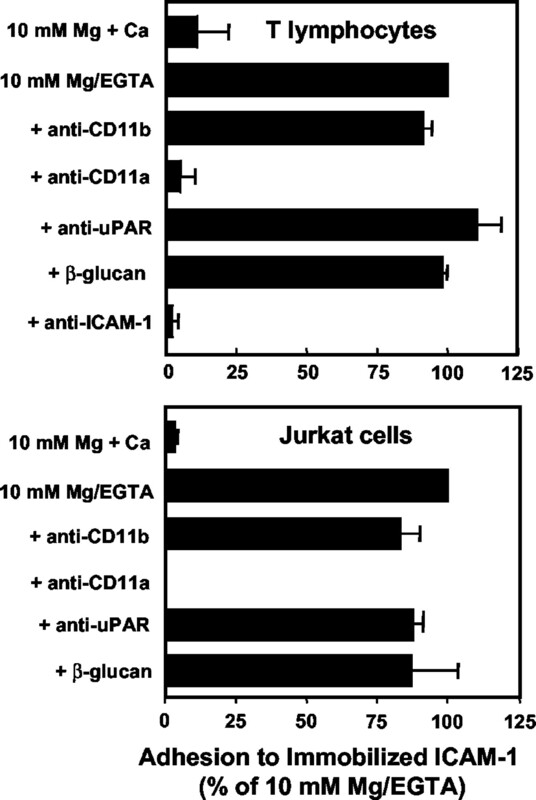 When Jurkat cells were similarly tested for a Mg2+/EGTA-induced RET from LFA-1 to uPAR, none was observed as shown in the bottom panel. Dotted lines in the histograms represent cells stained with FITC-conjugated anti-CD11b or anti-CD11a alone. These experiments were conducted five times examining a total of 181 neutrophils for RET in the presence of Mg2+ and three times without Mg2+ examining a total of 136 neutrophils. Jurkat cells were examined four times and a total of 152 individual Jurkat cells were evaluated for RET. Representative microscopic images are shown to the right of each fluorescence histogram. The lectin domain of Mac-1/CR3 was previously localized to the C-terminal region of CD11b in experiments that showed that ligation of a 10 kDa β-glucan to Mac-1/CR3 resulted in the selective masking of epitopes in the C-terminal region (8). A subsequent report mapped these C-terminal epitopes (47), allowing a comparison of epitope locations vs the amount that specific epitopes were masked by β-glucan attachment (Fig. 8⇓). The CBRM1/23 mAb defines an epitope (Fig. 8⇓, epitope subregion no. 4) that is both closest to the transmembrane domain of CD11b (47) and inhibited most by β-glucan binding (81%) to Mac-1/CR3 (8). By contrast, OKM1 defines an epitope subregion (no. 1) that is furthest from the transmembrane domain (47) and inhibited least (32%) by β-glucan binding to Mac-1/CR3 (8). The CBRM1/10 epitope (no. 3) is located adjacent and N-terminal to the epitope defined by CBRM1/23, and was masked by 74% following β-glucan ligation to Mac-1/CR3. These data suggest that the lectin domain responsible both for binding soluble β-glucan, and potentially also for generating lectin-dependent complexes between Mac-1/CR3 and GPI-anchored molecules, may be located near the transmembrane domain and epitope no. 4. Schematic diagram of the C-terminal region of CD11b showing the location of epitopes recognized by specific mAbs (OKM1, CBRM1/16, etc.) as reported by Lu et al. (47 ). The numbers are the positions of amino acid residues within CD11b, and the bracketed subdomains numbered 1–4 contain the epitopes recognized by these mAbs. 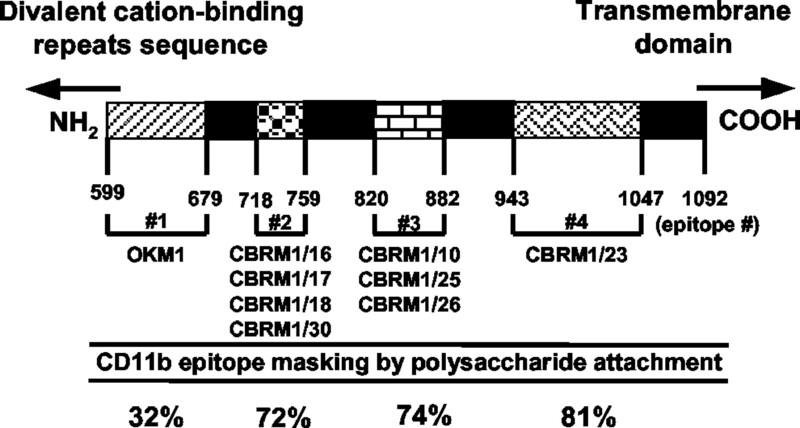 On the bottom are shown the percentage that each of the epitope subdomains are blocked by the prior ligation of a small soluble β-glucan polysaccharide to Mac-1/CR3 (8 ). Each percentage value represents the mean from six tests in which neutrophils were incubated first with β-glucan and then stained by an individual mAb using indirect immunofluorescence. The percentages shown for each epitope were derived from averaging the β-glucan masking activity for each of the mAbs that bound to a specific epitope subdomain. Based on these data, experiments were conducted to determine whether the formation of Mac-1/CR3 complexes with uPAR blocked any of these C-terminal epitopes in a similar manner to soluble β-glucan (Fig. 9⇓). Activation of neutrophils with PMA was used to generate the CBRM1/5 neoepitope that is a reporter for the H-AFN MIDAS (48). PMA activation produced a 140% increase in staining with CBRM1/5, and this increase was limited to 80% by the removal of 70–80% of GPI-anchored proteins via PiPLC before treatment with PMA (Fig. 9⇓). Neutrophil treatment with PiPLC alone had no effect on CBRM1/5 staining. Treatment with PiPLC, with or without subsequent activation by PMA had no significant effect on detection of the mAb24 H-AFN reporter neoepitope that is now recognized to be located within the I-domain of CD18 (49, 50) rather than a region common to CD11a or CD11b (37). Of particular note, treatment of neutrophils with PMA caused a 25% reduction in staining for the CBRM1/23 epitope (p < 0.05), despite the overall 90–100% increase in total Mac-1/CR3 surface expression as shown by staining with either OKM1 or I-domain-specific MN-41. This reduction in CBRM1/23 epitope staining despite a large overall increase in Mac-1/CR3 expression suggested that the CBRM1/23 epitope might be masked by uPAR at its attachment site to Mac-1/CR3. Removal of GPI-anchored proteins with PiPLC unmasked 40% additional CBRM1/23 epitopes on unactivated neutrophils (p < 0.05), and treatment with PMA after PiPLC resulted in significantly less masking of the CBRM1/23 epitope as compared with PMA-treated cells bearing native amounts of GPI-anchored proteins. However, even though there was no decrease in CBMR1/23 staining following PiPLC and PMA treatments, there was still partial masking of the CBRM1/23 epitope because there was no net increase in CBRM1/23 staining despite the overall 90–100% increase in total Mac-1/CR3 surface expression. A similar but reduced unmasking effect by PiPLC was also noted with the CBRM1/10 epitope that is adjacent to the CBRM1/23 epitope. As with the CBRM1/23 epitope, the large increase in total Mac-1/CR3 surface expression induced by PMA was not detectable by a comparable increase in staining with CBRM1/10 indicating some masking of this epitope on newly expressed Mac-1/CR3. 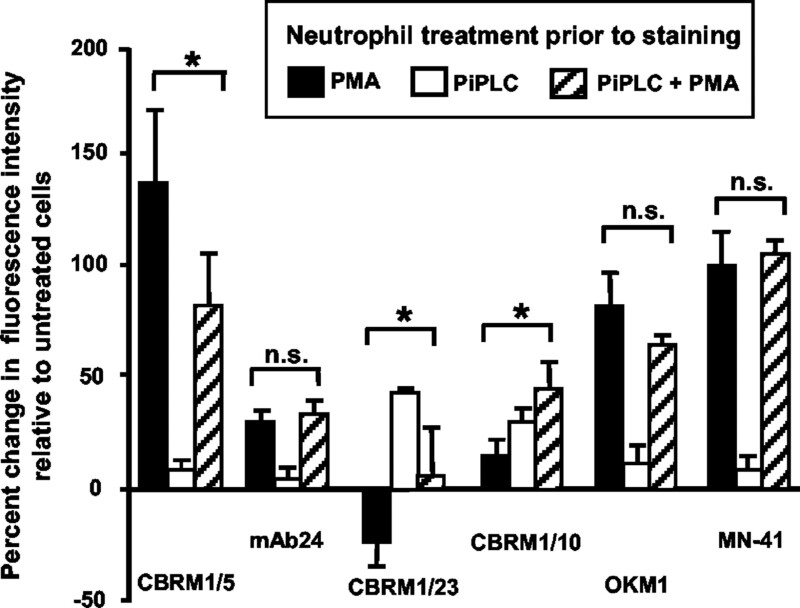 However, as with CBRM1/23, treatment of neutrophils with PiPLC to remove GPI-anchored proteins caused a significant increase in the amount of CBRM1/10 staining after PMA stimulation. By contrast, exposure of the OKM1 epitope that is separated by three epitope subdomains from the transmembrane region of CD11b, was not significantly affected by PiPLC treatment. PiPLC treatment had also no effect on expression of the I-domain epitope recognized by MN-41 (Fig. 9⇓) whose expression is also unaffected by the presence of β-glucan bound to CR3 (8). These data suggest that GPI-anchored proteins such as CD16b and uPAR bind to CD11b, masking the same C-terminal epitopes of CD11b that are masked by the binding of β-glucan to CR3. Neutrophil activation for adhesion that stimulates uPAR binding to Mac-1/CR3 results in masking of the same C-terminal domain epitopes of CD11b that were previously shown to be masked by the binding of β-glucan to Mac-1/CR3. Neutrophils were activated by treatment with PMA, with or without the prior removal of GPI-anchored proteins with PiPLC, and then monitored for staining with various FITC or Oregon Green 488-labeled mAbs. The percent change in neutrophil staining vs untreated cells incubated in buffer medium alone is shown on the y-axis. Staining for the GPI-anchored proteins CD16b, uPAR, CD55, and CD59 indicated that PiPLC removed only 70–90% of GPI-anchored proteins, and that PMA stimulation (without PiPLC treatment) caused the shedding of 60–70% of membrane CD16b but no detectable shedding of uPAR, CD55, or CD59 (not shown). The results represent the mean ± SD of more than or equal to three experiments. Significant differences (p < 0.05) in bracketed comparisons are indicated by a single asterisk. If the removal of GPI-anchored proteins enhanced the detection of the CBRM1/23 epitope because it was located adjacent to the lectin domain, then the removal of GPI-anchored proteins should enhance exposure of the lectin site and promote CD11b-specific binding of 125I-β-glucan. Both untreated and PiPLC-treated cells exhibited CD11b-specific binding of 125I-β-glucan that could be blocked by mAbs to CD11b (Fig. 10⇓). 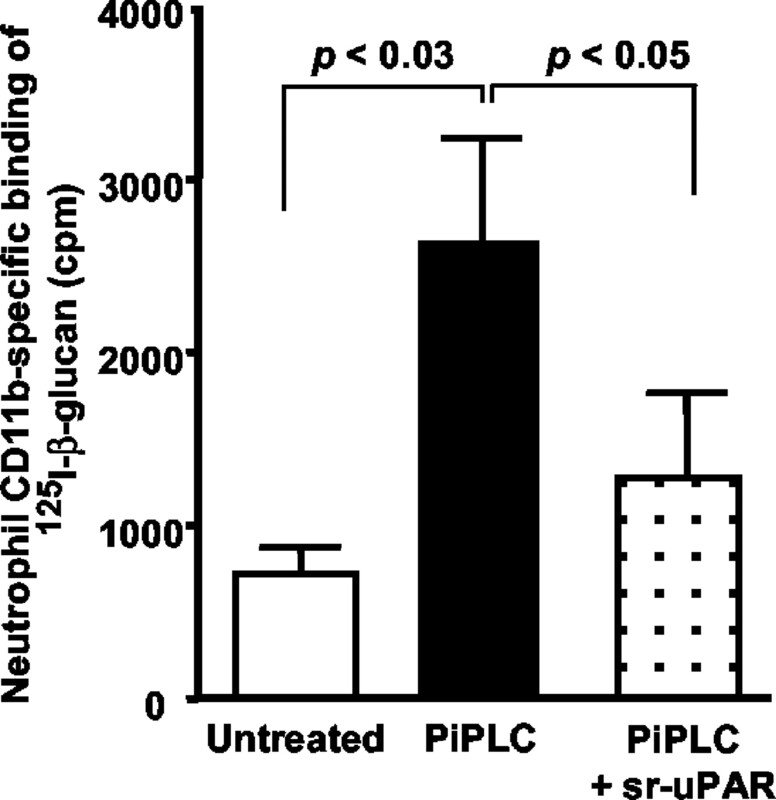 Moreover, PiPLC-treated neutrophils exhibited a 3.5-fold higher CD11b-specific binding of 125I-β-glucan than did untreated cells, despite the finding that such treatment with PiPLC did not increase the overall expression of Mac-1/CR3 (Fig. 9⇑). Because PiPLC removes a proportion of all the various types of GPI-anchored proteins and not just uPAR, the specific activity of uPAR was explored by reconstituting a portion of the PiPLC-treated neutrophils with 10 μg/ml sr-uPAR in a manner that had been previously shown to restore membrane-bound uPAR (33). 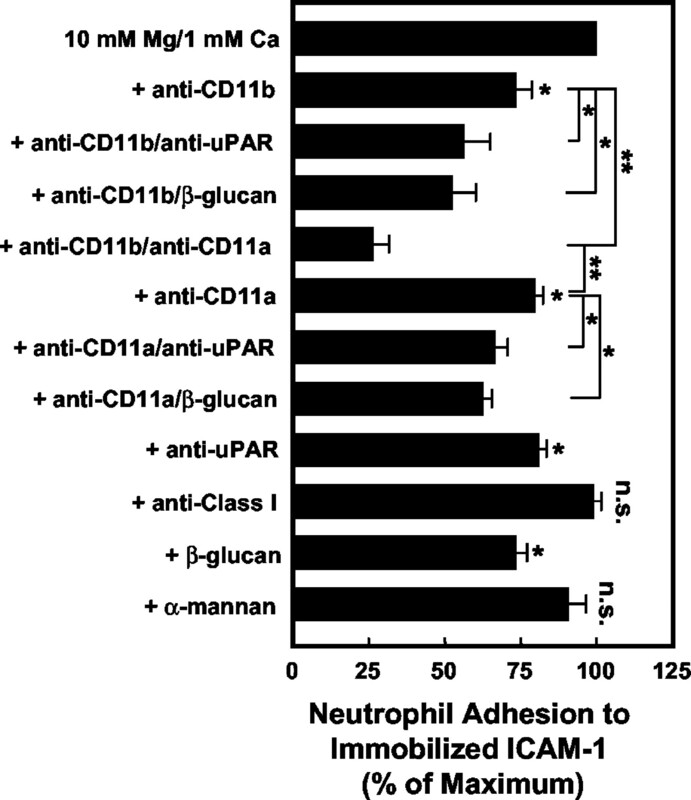 Reconstitution of uPAR to the PiPLC-treated neutrophils reduced the level of CD11b-specific binding of 125I-β-glucan to a similar level as untreated neutrophils (Fig. 10⇓). β-Glucan binding to Mac-1/CR3 is enhanced following removal of GPI-anchored proteins from neutrophils and this enhancement is reversed by sr-uPAR. Neutrophils were incubated with or without PiPLC, and then a portion of the PiPLC-treated neutrophils were uPAR-reconstituted by incubation with 10 μg/ml sr-uPAR. Neutrophils were then tested for CD11b-specific binding of 125I-β-glucan by determining the net binding of 125I-β-glucan cpm following blockade with a mAb to CD11b. The results represent the mean ± SD for three assays. The increase in uptake of 125I-β-glucan after PiPLC treatment was significant (p < 0.03), as was the decrease in 125I-β-glucan uptake following sr-uPAR reconstitution of the PiPLC-treated cells (p < 0.05). Although lectin-dependent complexes between GPI-anchored FcγRIIIB and Mac-1/CR3 exist on unstimulated neutrophils (20), the current investigation suggested that additional lectin site-dependent complexes between Mac-1/CR3 and uPAR might be generated with cellular activation for adhesion. It was thus hypothesized that activation of neutrophils for adhesion would cause the lectin site to be masked by uPAR. Tests for the uptake of 125I-β-glucan (∼10 kDa) by neutrophils that had been incubated for 30 min at 37°C in RPMI 1640 medium containing 10 mM Mg2+/1 mM Ca2+ (that generates only L-AFN Mac-1/CR3 adhesion) showed that the Mac-1/CR3-specific uptake of 125I-β-glucan was reduced from 4100 ± 422 cpm to 1024 ± 85 cpm (a reduction of 75%; p < 0.01) as compared with cells incubated in normal RPMI 1640 medium (not shown). These data suggest that uPAR competes with β-glucan for binding to the same lectin site of Mac-1/CR3 and, along with RET (Fig. 7⇑), serve as an additional demonstration that a complex formation between uPAR and Mac-1/CR3 is associated with L-AFN as well as H-AFN adhesion. This investigation confirmed the hypothesis that uPAR, and probably also other GPI-anchored glycoproteins, form membrane complexes with CR3 via the same lectin site that had previously been shown to be responsible for priming CR3 for phagocytosis or cytotoxic degranulation in response to iC3b-opsonized target cells. Not only does β-glucan dissociate membrane complexes between uPAR and CR3 (51, 52), but also the current studies demonstrated that β-glucan also inhibits CR3-dependent adhesion to ICAM-1 or fibrinogen. 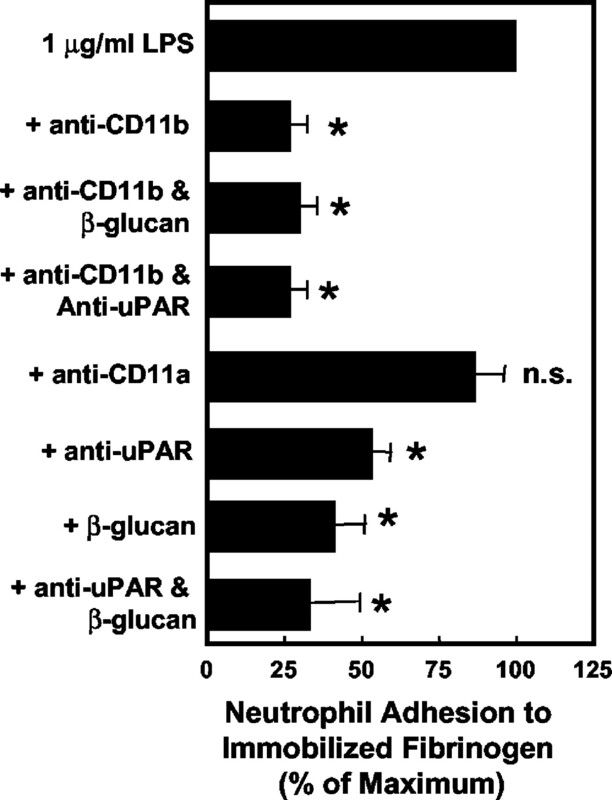 Moreover, uPAR competes with β-glucan for binding to CR3. Finally, the generation of adhesion through formation of membrane complexes between uPAR and CR3 was shown to mask selectively the same C-terminal epitopes of CD11b that had been reported previously to be masked by the binding of soluble β-glucan to CR3. An unexpected finding was that uPAR complexes with Mac-1/CR3 were involved in mediating adhesion via L-AFN as well as H-AFN binding sites. The current investigation used fluorescence microscopy measurements of RET to demonstrate the formation of uPAR complexes with Mac-1/CR3 under conditions of neutrophil stimulation with 10 mM Mg2+/EGTA that did not generate either the CBRM1/5 reporter neoepitope or CD11b-dependent binding of fluid-phase ICAM-1. Previous research using RET analysis had shown similar uPAR complexes with Mac-1/CR3 when the H-AFN MIDAS was generated through neutrophil stimulation with 1 mM Mn2+/EGTA (17). With T cells, avid adhesion via L-AFN LFA-1 has been proposed to require cytoskeleton-dependent membrane clustering of LFA-1 (6). From the current data it is hypothesized that L-AFN Mac-1/CR3 adhesion may involve a similar clustering of L-AFN Mac-1/CR3 that is regulated by uPAR. Initial attempts to map the lectin site of CR3 by use of blocking mAbs to specific epitopes of CD11b had been hampered by mAb-induced conformational changes that produced an allosteric blockade of β-glucan binding to CR3 such that mAbs specific for nearly any epitope location on CD11b inhibited β-glucan binding to CR3 (8). However, because of the relatively high binding affinity of small β-glucans to CR3 (50 nM), it was possible to show that attachment of a small (10 kDa) β-glucan to CR3 selectively inhibited the binding of mAbs directed to epitopes of CD11b that were located in the large region of CD11b located C-terminal to both the I-domain and divalent-cation-binding region. The epitope that was most effectively masked by β-glucan attachment to CR3 was defined by mAb CBRM1/23 (8), and a subsequent report showed that this epitope was at the C-terminal end of CD11b, adjacent to the transmembrane domain (47). The current investigation provided evidence for the masking of two C-terminal epitopes following activation of CR3 for adhesion and formation of lectin-dependent membrane complexes between CR3 and uPAR. As with blocking by β-glucan, the epitope most effectively masked by complex formation with uPAR was CBRM1/23, followed by the adjacent CBRM1/10 epitope. By contrast, CR3 activation had no effect on detection of the OKM1 epitope that is at the N-terminal end of the C-terminal region of CD11b. Taken together these data suggest that the lectin site may be near to the CBRM1/23 epitope at the membrane proximal end of CD11b. A direct competition between GPI-anchored proteins and soluble β-glucan for binding to Mac-1/CR3 was demonstrated. Treatment of unstimulated neutrophils with PiPLC enhanced CD11b-dependent binding of 125I-β-glucan, indicating that the lectin-dependent binding of CD16b that has been demonstrated with resting neutrophils probably also occurs via the same β-glucan-binding lectin site. Although the enhanced binding of 125I-β-glucan was reversed by addition of soluble uPAR, it probably would have been possible to accomplish the same blockade of the lectin site by reconstitution with soluble CD16b. In this regard, others have reported that soluble CD16b is taken up by neutrophils via a lectin-dependent/sugar inhibitable binding to Mac-1/CR3 (53). Because sugar-inhibitable complexes between LFA-1 and FcγRIIIB had been shown (20), as well as the coimmunoprecipitation of uPAR with LFA-1 (21), tests were also conducted to determine whether uPAR or some other GPI-anchored receptor might also regulate LFA-1 adhesion to ICAM-1. Normal blood T cells do not express uPAR, but uPAR is a marker of activated T cells (40), and T cells migrating into tumors have been shown to express uPAR (54). On neutrophils that express both LFA-1 and CR3, adhesion to ICAM-1 was inhibited equally by mAbs to CD11a and CD11b, and a mixture of both mAbs had an additive effect indicating that these integrins functioned together in mediating adhesion to ICAM-1. Nevertheless, anti-uPAR alone inhibited adhesion to the same extent as anti-CD11b or soluble β-glucan alone, suggesting that uPAR functioned only with CR3. Moreover, there was only a slight additive effect on anti-CD11b inhibition of adhesion by mixing anti-CD11b with β-glucan or anti-uPAR, indicating that each have the same CR3 target and cannot block the residual adhesion mediated by LFA-1. T lymphocytes and the Jurkat T cell line differed from neutrophils in that PiPLC treatment had no significant effect on adhesion to ICAM-1. Moreover, with Jurkat cells that expressed uPAR on the majority of cells, there was also no effect on LFA-1 adhesion by anti-uPAR or β-glucan. These experiments suggest that LFA-1 differs from CR3 in use of uPAR for generating a H-AFN adhesion site. However, other conditions may be required to demonstrate a function for T cell uPAR because experiments with uPAR-deficient mice have demonstrated a reduced T cell migration into inflammatory sites resembling normal mice treated with anti-CD11a or anti-ICAM-1 (13). This investigation highlights the role of the lectin domain of CD11b in promoting the H-AFN MIDAS conformation in the distal I-domain. Previous studies had shown induction of the CBRM1/5 H-AFN MIDAS reporter neoepitope on neutrophils incubated with soluble β-glucan (11). In addition, the CD11b lectin domain binding to Candida albicans yeast cell walls had also been shown to induce the H-AFN MIDAS conformation in the distal I-domain. It is of interest that when the C-terminal region of CD11b was replaced with the C-terminal region of CD11a, the rMac-1/CR3 expressed a H-AFN MIDAS conformation and bound to C. albicans in a sugar/lectin-independent manner (12). The lack of need for a lectin domain in LFA-1 for adhesion corresponds to the current data showing an apparent lack of use of GPI-anchored proteins in T cell adhesion. In what appears to be a contradiction to the anti-adhesive activity of β-glucan shown in this study, previous studies had shown that soluble β-glucan could induce the CBRM1/5 epitope that is a reporter for the high-affinity I-domain MIDAS. Nevertheless, this same report also noted that soluble β-glucan failed to induce neutrophil spreading or adhesion (11). The current investigation suggests that adhesion requires more than a H-AFN binding site, and additionally requires the formation of CR3 complexes with uPAR that may induce clustering of CR3 (55). Thus, although β-glucan binding to CR3 induces its H-AFN binding site, it prevents adhesion by blocking CR3 complex formation with uPAR. Such a membrane clustering of β2 integrins has been proposed to be required for adhesion via L-AFN or H-AFN binding sites (56, 57). Although the highly glycosylated uPAR appears to initiate its interaction with CR3 through the lectin domain, there are likely to be two or three additional sites of interaction between uPAR and Mac-1/CR3. An additional interaction has been shown to occur at a discrete site within the divalent cation-binding region that is C-terminal to the I-domain at residues 424–440 (58). Following uPAR complex formation with Mac-1/CR3, occupation of uPAR with its ligand urokinase causes Mac-1/CR3 to reverse its adhesion to ICAM-1 or fibrin (59), and secondarily, the uPAR portion of the complex develops a binding site for vitronectin (60). A peptide corresponding to this interaction site designated M25 and identified initially by phage display was shown to inhibit both the urokinase-induced adhesion to vitronectin as well as Mac-1/CR3/uPAR adhesion to fibrin (58). These data indicate that this interaction site at residues 424–440 is required for development of H-AFN MIDAS-dependent adhesion in addition to the lectin site located near the CBRM1/23 epitope at residues 943-1047. It is unknown whether there is a different type of interaction at this secondary site when urokinase binds to uPAR that results in disruption of the H-AFN MIDAS conformation or alternatively whether there is a third site of Mac-1/CR3/uPAR interaction. Although these studies failed to show a function of uPAR in LFA-1-dependent adhesion, other studies have shown an involvement of uPAR in the adhesion function of β1, β3, and β5 integrins (19, 61). Moreover, the complexes between uPAR and β1 or β3 integrins were shown to be disrupted by NADG in the same way as this sugar disrupts uPAR complexes with β2 integrins, suggesting that a lectin domain may be a common feature of integrins allowing them to interact with uPAR (19). We thank Dr. Timothy A. Springer (Center for Blood Research) and Dr. Nancy Hogg (Imperial Cancer Research Fund) for the generous donation of several well-characterized mAbs specific for CD11a and CD11b. We also thank Dr. Martin Low (Columbia University) for providing the quantities of purified PiPLC required for these studies. Other colleagues who generously provided mAbs or hybridomas include Dr. Lewis Lanier (University of California, San Francisco) and Dr. Jay Unkeless (Mt. Sinai School of Medicine). We especially thank Dr. Donald Stanton (ICOS Pharmaceuticals) for the generous gift of rICAM-1. ↵1 This work was supported by National Institutes of Health Grants CA86412 (to G.D.R. ), CA42246 (to R.F.T. ), and AI27409 (to H.R.P.). ↵4 Abbreviations used in this paper: CR3, complement receptor type 3; iC3b, factor I-cleaved C3b fragment of C3; H-AFN, high affinity; L-AFN, low affinity; MIDAS, metal ion-dependent adhesion site; uPAR, urokinase plasminogen activator receptor; PiPLC, phosphatidylinositol-specific phospholipase C; sr-uPAR, soluble recombinant uPAR; NADG, N-acetyl-d-glucosamine; RET, resonance energy transfer; TRITC, tetramethylrhodamine isothiocyanate; 125I-β-glucan, 125I-labeled β-glucan. Todd, R. F., III, M. A. Arnaout. 1986. Monoclonal antibodies that identify Mo1 and LFA-1, two human leukocyte membrane glycoproteins: a review. E. L. Reinherz, III, and B. F. Haynes, III, and L. M. Nadler, III, and I. D. Bernstein, III, eds. Leukocyte Typing II. Volume 3: Human Myeloid and Hematopoietic Cells 95 Springer-Verlag, New York.